Enjoy an evening with three seasoned voices from CanLit. Guy Vanderhaeghe reads from Daddy Lenin and Other Stories, a timely collection focusing on masculinity; Mark Anthony Jarman reads Knife Party at the Hotel Europa, where an acutely lonely man finds the beauty in life; and Joan Thomas reads from The Opening Sky, in which an urbane, progressive family is forced to confront past tragedy. Guy Vanderhaeghe is currently considered a "single author." If one or more works are by a distinct, homonymous authors, go ahead and split the author. 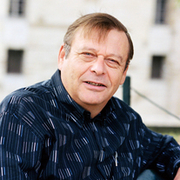 Guy Vanderhaeghe is composed of 5 names. You can examine and separate out names.